How Is Dark Social Affecting Your Brand? The term “dark social” is kicked around every so often by marketers. But what is it, how does it affect your brand, and how you can measure it? Messaging apps continue to be on the rise with no end in sight, and they come with a bunch of new opportunities for marketers. The prize: billions of active monthly users, including coveted millennial and Generation Z consumers. The four most popular messaging apps already have more monthly active users than the four major social networks. According to a recent estimate, 16 percent of the world’s population is using Whatsapp. The marketing potential is endless. AI-based technologies are bridging the gap between users and brands on a one-to-one basis, offering bots for ordering pizza and settling customer service questions in private. There are great examples on how brands are leveraging this, but the age of messenger communication also comes with a new set of challenges that already have an impact on your brand. The question is: How big is that impact, and how are brands supposed to measure it? Dark social describes the “invisible” shares that happen through channels like messengers, but also email and text messages. If you go to The New York Times right now, pick any article, and send the URL via Facebook Messenger to one of your friends, you’ve shared it via dark social. For the NYT team, that share will come up as “direct,” even though you didn’t type the whole link into your browser. They won’t know where you got the article from, making dark social a form of referral traffic that is attributed to the wrong channel. The term was coined by Alexis Madrigal of The Atlantic in 2012, who then said we’re only seeing—and measuring—the tip of the sharing iceberg. And he was right, of course. The private nature of these channels makes it near impossible for marketers to find out easily what the source of the traffic is. Is Dark Social Messing with Your Metrics? This is the crux of the matter: How do you produce numbers for something that can’t be measured? The dark social stats that are being cited in many articles trace back to only one source. Marketing firm RadiumOne that says more than 80 percent of all shares are “dark.” That would mean you’re basing your advertising dollars on only 20 percent of what’s actually happening—not a great idea. But don’t take out the big red marker just yet. According to RadiumOne data, 84 percent of shares happen via dark social. If 80 percent seems high, we’re on the same page, so let’s see what else there is. For The Atlantic, Madrigal wanted to know a ballpark estimate on dark social shares, and together with their web analytics firm came up with a relatively straightforward way to show how much traffic was falsely attributed to “direct.” Of all the “direct” visitors, they excluded people that landed on the homepage or a category page, essentially leaving only the people reaching a post because they’d gotten the link from somewhere. Combining this with their available sharing data, they got to this graph, which says more than 50 percent of their social shares happens via dark social. That was in 2012, when messengers were less popular. Nevertheless, keep in mind that not all brands are The Atlantic, and news outlets tend to receive a lot more shares than, say, a B2B marketer. I live by, “Never trust a stat you haven’t faked yourself,” so we did our own little bit of research. 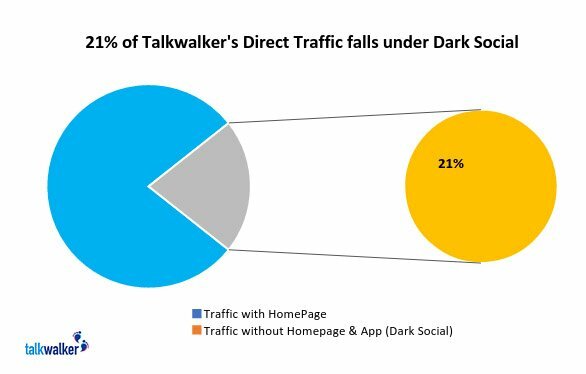 The percentage of Talkwalker’s direct traffic isn’t as high as other sources have reported, but still significant. If we look at our direct traffic in Google Analytics and exclude traffic to the homepage, landing page, and app, we see that 21 percent of our traffic comes from dark social sources. We also looked at the lead figures for a recent webinar. Five percent were attributed to direct by Google Analytics, even though the sign-up page was not accessible anywhere on the website. That means it’s not possible that these people landed on the page directly, and our analysis wasn’t entirely accurate. Now, you see that this dark social number is way lower than the 80 percent advertised by RadiumOne, but whatever the number is for your brand, your web analytics are probably a little wonky in this respect. Should Your Brand Worry About Dark Social? Social attribution, or assigning credit to your social efforts, will only grow in importance. CMOs want to track where their dollars are going and be able to show what they get out of social. You want to make the best possible decision, so you need numbers that tell the truth without obfuscating anything. But rather than thinking about it as something you’re not doing well just yet, think of all the future potential. Dark social is definitely an area of potential for brands, and marketers should start to leverage it where they can. The biggest part of this is making sure you’ve got access to the right data. You can only make informed decisions about where to spend your dollars if you know what’s working and what isn’t. Create a dark social segment in Google Analytics and find out what percentage of your traffic is being attributed to the wrong source. Analyze earned, owned, and paid together, so you can start optimizing and tweaking campaigns and content to move customers along their purchase paths. In your social media analytics tool, you can overlay it with your mentions and social shares to shed some light on how your customers are sharing. If you want to go even further, we’ve listed some tools below that help you make sense of dark aocial traffic. Use link shorteners like Bitly or Owly, which can shed some light on your sharing. You can get a better understanding of the clicks your links receive if you use a tracked link. Improve your sharing buttons with a tool like sharethis, which lets you implement inline or sticky share buttons to make it easier to track if people share your content via email, messenger, or text. If you want to really crack the dark social code, look at GetSocial or Po.st. They’re pricey options, but you’ll know you’ve covered your bases. If you want to find out more about how your measuring strategy can help you improve ROI, download Talkwalker’s free report.